Lowell National Historical Park trolleys provide educational transportation and a unique orientation to the park. Canal boat at Swamp Locks. 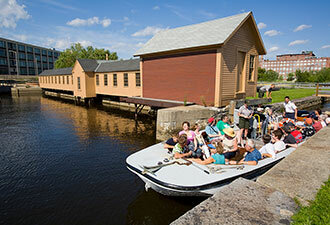 Every day is Labor Day at Lowell National Historical Park. Founded as a textile manufacturing center northwest of Boston, Lowell thrived during the 19th century, attracting many immigrants and migrant workers to its mills. Today, the park weaves the city’s history and culture with its lively downtown. From the Boott Cotton Mills Museum and the Mill Girls and Immigrants Exhibit to the American Textile History museum – a park partner, the region’s industrial history speaks to our coming of age. Come tread the same cobblestones and mill floors where generations of workers created the booming textile industry of a young nation. The din of machinery and the lilt of a dozen languages still echoes beneath the sounds of modern city life and the soft swoosh of the Merrimack River, which was the lifeblood of the mill town. Welcoming walkways along the river and canals encourage meandering, as rich history and stunning architecture surround you. 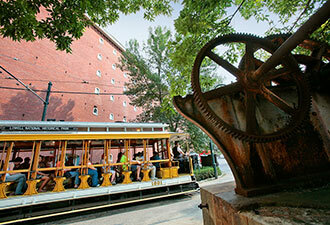 Travel by foot or trolley evokes the city’s past, and you may encounter Kirk Boott, an early mill manager, or Lucy Larcom, a writer and teacher – figures from Lowell’s past who like to reminisce. Members of the Youth Theater Program bring them to life as members of the “Spindle City Corps,” a partnership between the park and Community Teamwork, Inc.
Join a national park ranger on an in-depth tour of the canals and learn about the “mill girls” who left farm and family for boardinghouse life and work in the mills. Unlike working the looms, it’s easy to get kids to love Lowell. Begin your visit in the Children’s Corner at the visitor center, and enjoy hands-on activities that teach about mill technology through gears and pulleys. To see how raw cotton becomes cloth, kids can pick up their aprons and time cards and get to work at the Boott Cotton Mills Museum. But, don’t jump to the conclusion that Lowell is only about cotton cloth; its later history weaves a rich tapestry of art, literature, and song. From the books of Beat icon and Lowell native Jack Kerouac to the birthplace of artist James McNeill Whistler, Lowell maintains a lively arts scene that reflects its immigrant influence. So visit more than once to enjoy annual community events that bring even more opportunities for learning and fun including the Lowell Folk Festival, Doors Open Lowell, Lowell Summer Music Series and the Southeast Asian Water Festival. 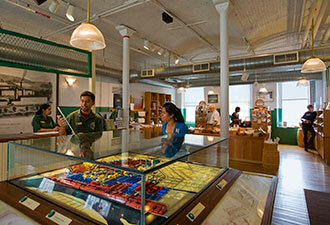 At Lowell National Historical Park, the story of industry is alive and its rhythm continues.